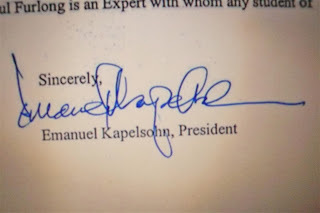 I haven’t collected many Degrees to frame or put on the wall, but maybe this letter of Recommendation from “Manny” Kapelsohn will suffice. It is my Pleasure to write this letter about Paul Furlong. 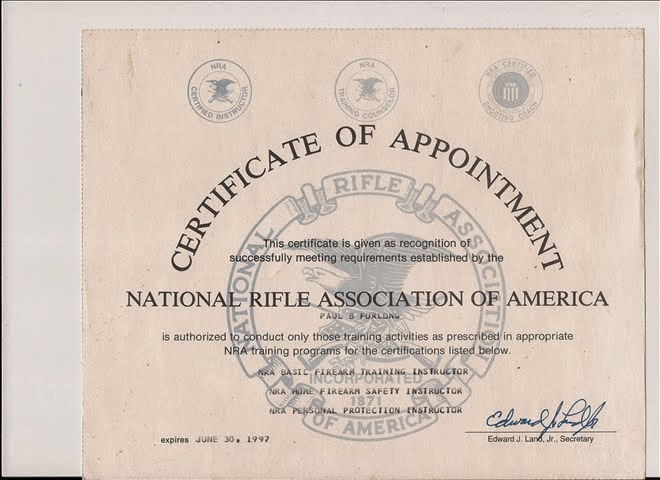 I have known Paul since the 1970’s when we lived in New Jersey and were both heavily involved in defensive handgun and shotgun training and competition. Since then our paths have diverged geographically, but we have both pursued the “way of the gun.” Truly, it has been a lifetime study for both of us. By way of introducing myself, while I hold degrees from Yale University and Harvard Law School, and have practiced law and taught in the Criminal Justice Department at Indiana University, I spend most of my time conducting firearms and the use of force training programs, primarily for law enforcement instructors and officers but also for private citizens throughout the United States and occasionally abroad. I also work as an expert witness nationwide in court cases resulting from shootings, whether by police or private individuals, for clients that have included the U.S. Department of Justice, several federal agencies, the Attorneys General of several states, and major U.S. cities and police agencies. I am trained and certified in shooting scene reconstruction, force science, psychomotor skill design, and numerous related disciplines. After working as a Staff Instructor at Colonel Jeff Cooper’s American Pistol Institute, (“Gunsite”) from about 1979 to 1983, I have served for nearly 30 years on the Board of Directors of the International Association of Law Enforcement Firearms Instructors (IALEFI), and have trained and certified firearms instructors for agencies including the police departments of Philadelphia, Baltimore, Washington D.C., Phoenix, Seattle, Dallas, Miami, the New York State Police, Oregon State Police, Louisiana State Police, Missouri Highway Patrol, Toronto, Calgary, several police forces in the Caribbean and South America, and many many others. I have also worked and continue to work, as an active reserve law enforcement officer myself, which provides me with essential experience as a weapons and use of force trainer. In total, since 1977 I have trained some 15,000 people, including private citizens, executive protection and security officers, police officers and instructors, SWAT operators, federal agents, and military personnel. Based on the foregoing, I can declare that anyone with the good fortune to have Paul Furlong as his defensive firearms instructor is a lucky student indeed. Today there are far too many “gun gurus” whose knowledge of defensive firearms use consists of what they’ve read in the newsstand gun periodicals, from some success in shooting competition, or perhaps from sitting at the feet of a “gun guru” with a similar background. Surprisingly, many of these would-be instructors don’t even carry a gun themselves except when they’re at the shooting range! 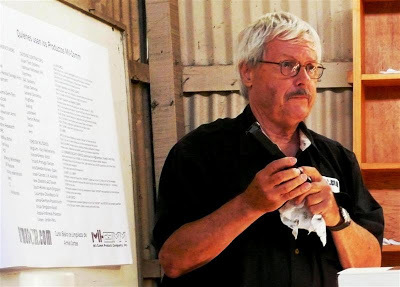 In contrast, Paul Furlong has spent a lifetime building his knowledge of this subject, selecting what he teaches from sources as diverse as the methods of Jeff Cooper, those taught by the NRA in its Personal Protection Courses, things he may have picked up in programs taught by John Farnam and me, and techniques he has developed himself over 40 years of intensive study. And unlike those instructors whose knowledge of using a gun in a deadly force encounter is purely theoretical, based on gun magazines or shooting range fantasies, Paul is an instructor with a lifetime of practical experience, one who has actually “seen the elephant” and knows whereof he speaks. 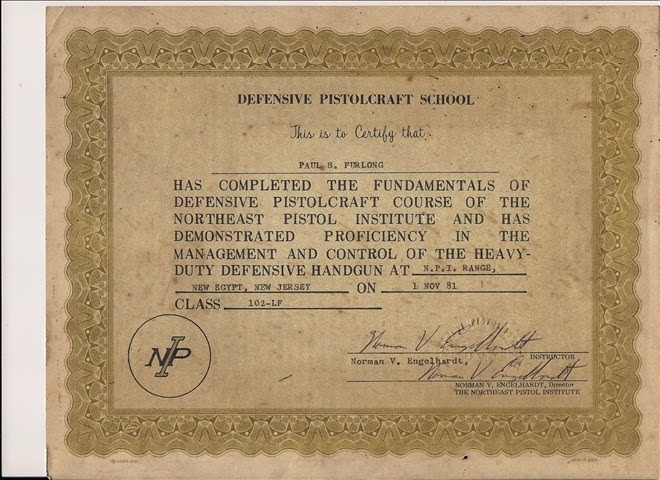 When I taught under Colonel Cooper, his standard for awarding one of our students an “E-ticket” (that is, an Expert rating at Gunsite) was that, after a week of critical observation in the crucible of that very rigorous training program, our instructor cadre unanimously agreed they were someone we would choose to have with us in a gunfight. Understandably then, earning that Expert rating was not just a matter of marksmanship ability – the world, after all, is full of good marksmen – but required the candidate to possess the mindset, judgment, alertness, determination and other personal qualities that would make our instructor cadre comfortable entrusting our lives to that person’s care, should our own abilities not be entirely equal to some unknown challenge. By that high standard, Paul Furlong is an Expert with whom any student of defensive shooting should be honored to train. CR Shooting Instruct… on Night Shoot!! !